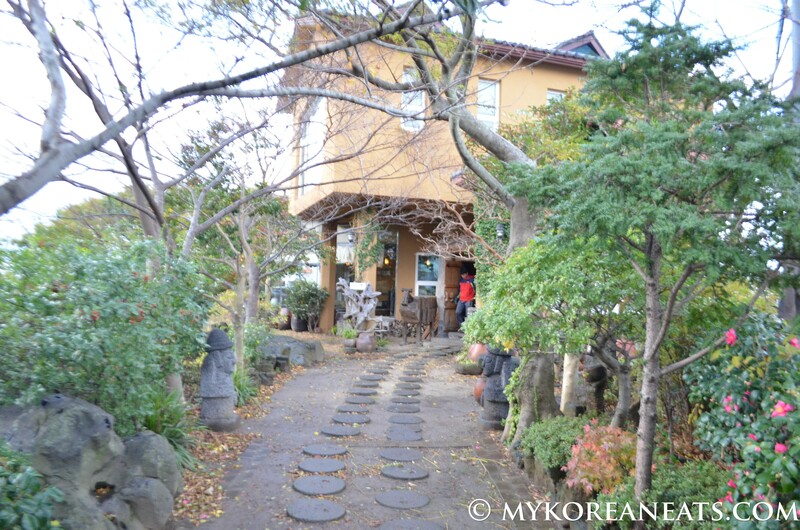 “I bought this area of land to save this tree.” That’s the response I got when I asked the owner of Dasoni, a popular vegetarian and well-being restaurant in Jeju city, how she got into the restaurant business. Surprised at her response, she explained further that as a child she grew up playing around the sprawling tree (which is still visible to this day from the main dining area). Fast forward to adulthood…. just as the tree was to be uprooted, that’s when she stepped in and bought the surrounding land. And making good use of the land (and tree), she opened up Dasoni shortly thereafter. 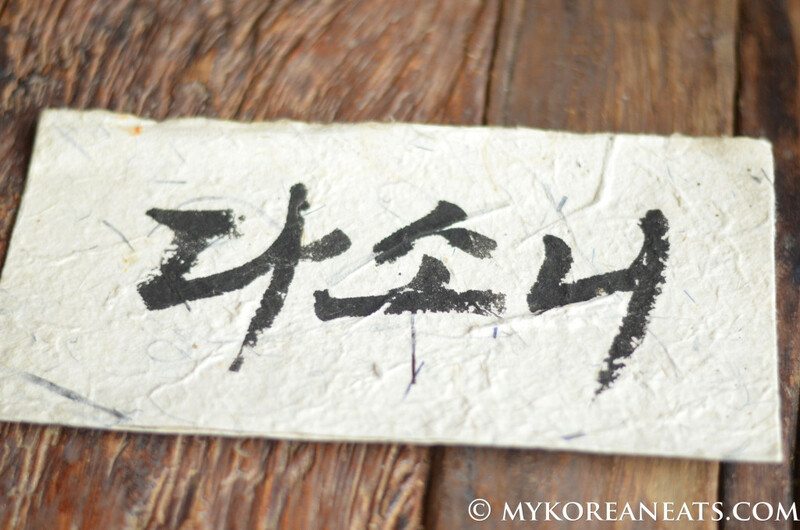 Open for over 8 years, Dasoni has been serving up delicious and healthy traditional Korean food in a chogajip-inspired atmosphere. 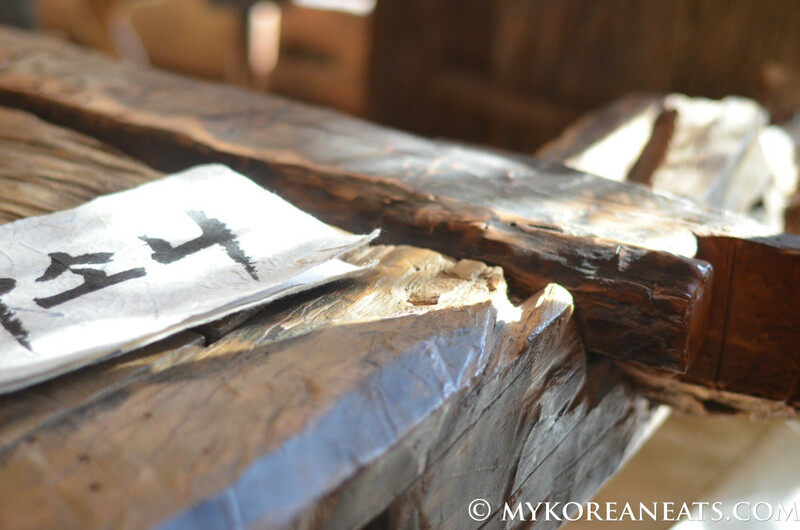 Most of the wood used in the interior were brought over from old chogajip homes, creating not only a rustic setting but also making it feel like you’re dining in a different time period. Adding to its appeal, calligraphy paintings on hanji, handcrafted ceramics, and other traditional ware are carefully placed throughout the restaurant. 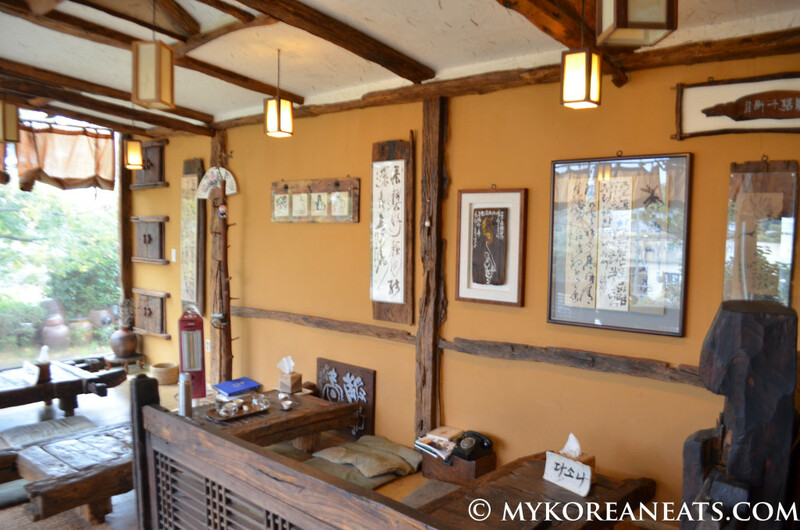 The food is just as simple and traditional as the decor, with bibimbab, deullkae sujebi, yeonip bab, and danpatjuk being their recommended dishes. 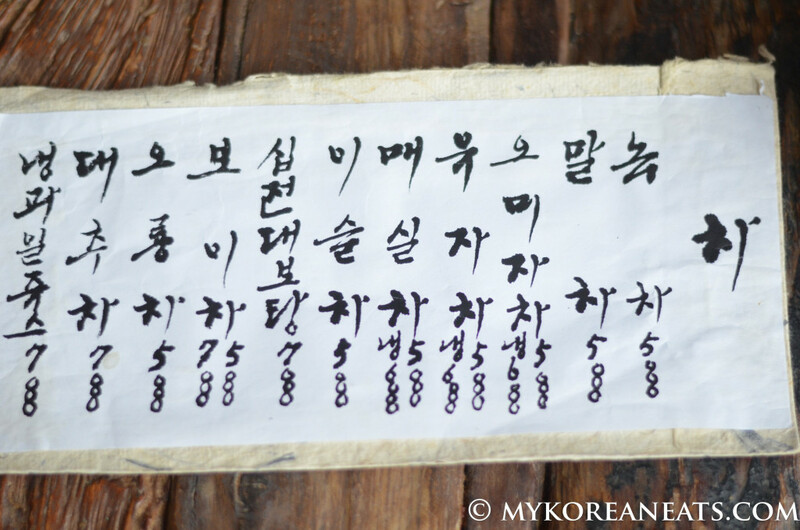 All items range from a reasonable 7,000 won to 10,000 won. 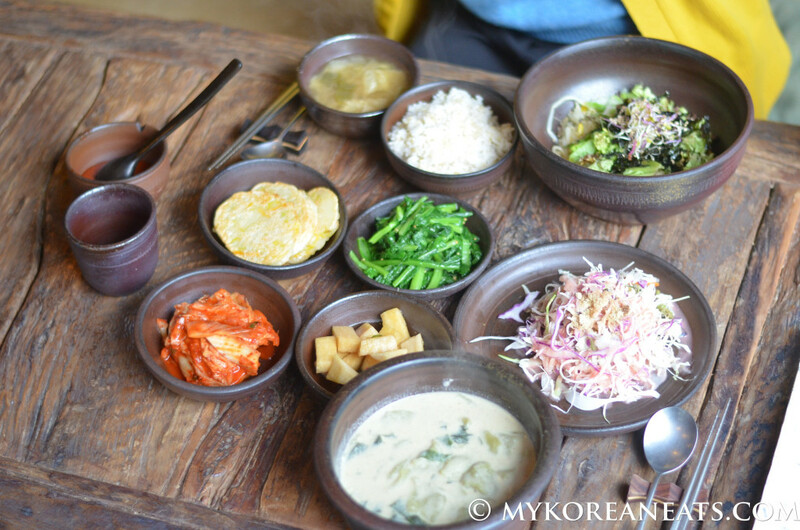 Banchan consist of freshly made kimchi, shigeumchi namul, hobak jeon, pickled radish, and salad. 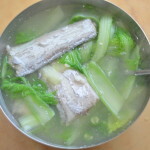 No MSG and other preservatives are used in their dishes. 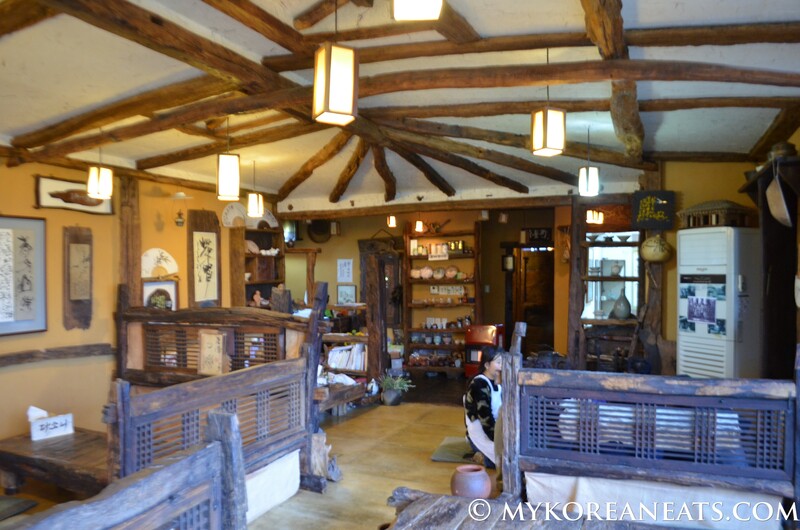 In addition to purely vegetarian options, the restaurant also serves a variety of teas ranging from omijacha (sweet berry tea) to meshilcha (sweet plum tea). For my personal take on each dish, see pictures below. 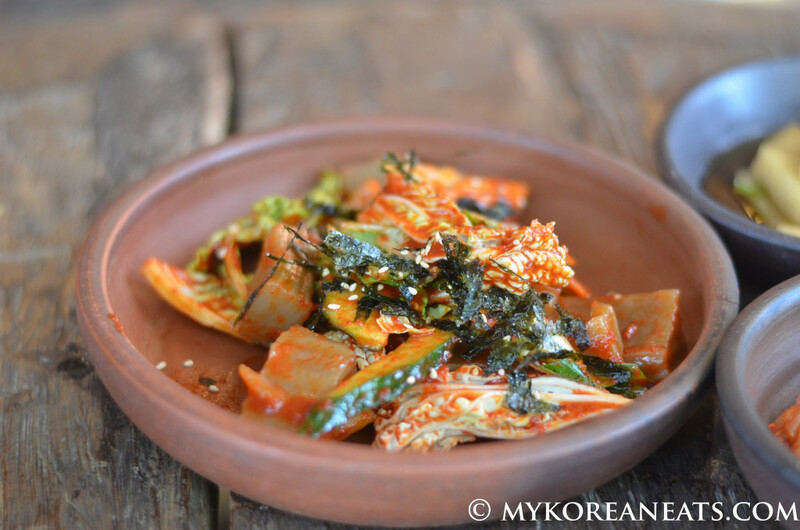 One of the many banchan that came out. This salad was nice and fresh with a sweet strawberry dressing. The five banchan combination was a nice play with the taste buds, providing something sweet, salty, sour, bitter, and umami. Good stuff! 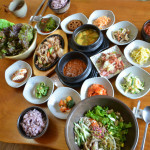 No Korean meal is complete with banchan, and here they’re serving the freshest and healthiest sides around. Each one of them tasted like they were just made on the spot, no joke! 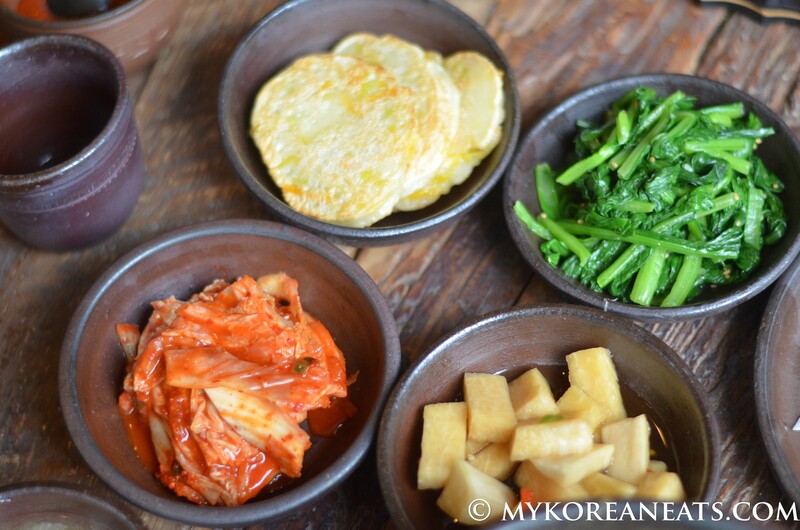 Clockwise bottom left: fresh kimchi, hobak jeon (pumpkin pancakes), shigeumchi namul (seasoned spinach), and pickled radish. 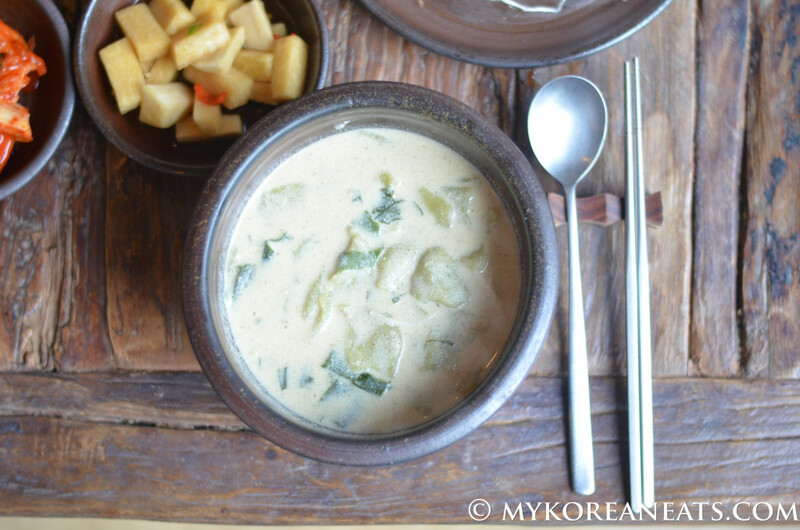 Banchan doesn’t get any better than this…..fresh, crisp, and healthy. 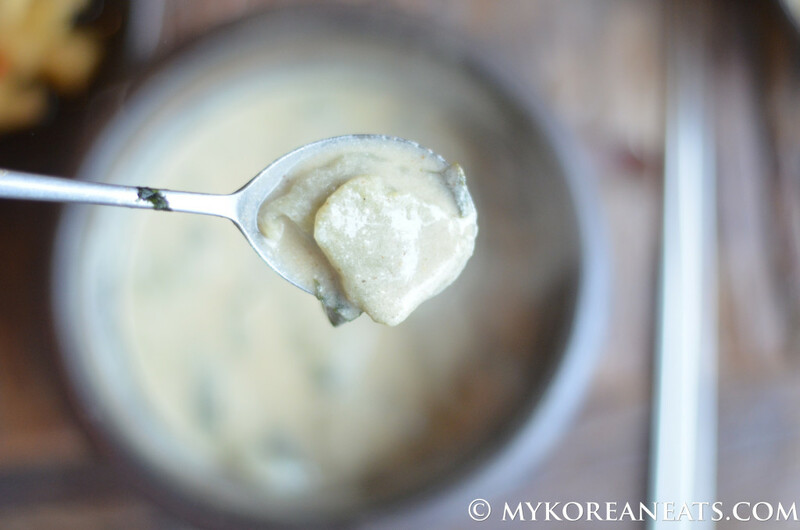 Deulkkae Sujebi (Hand-Torn Pasta in Perilla Seeds Broth): Another winning dish with soft, chewy dough pieces in a super comforting, nutty, creamy broth. 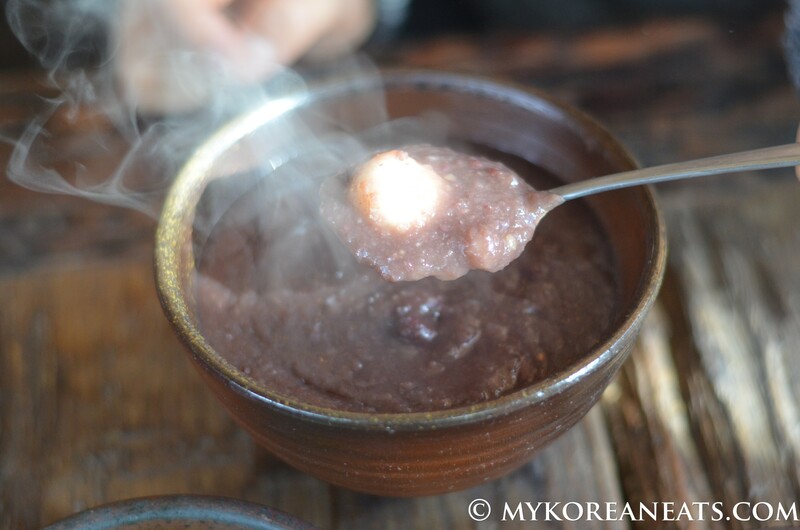 In the cold weather, nothing beats a bowl of steaming sujebi. Cost is 7,000 won (approx. $7). Personally, I like my sujebi pieces a little thicker and bigger than what they served here but that’s just me being picky. 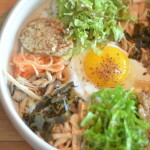 This dish is great paired with bibimbab because of the two vastly different textures. If you’re going with a friend, make sure to share each other’s dishes. 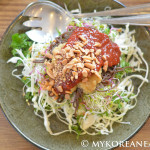 Vegetarian Bibimbab: With a combination of fresh and healthy ingredients, this bibimbab is full of flavor and textures in a sweet n slightly spicy sauce. 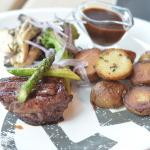 Surprisingly, the meaty shiitake mushrooms could have passed as the protein in the dish making me one happy diner. Cost is 7,000 won (approx. $7). 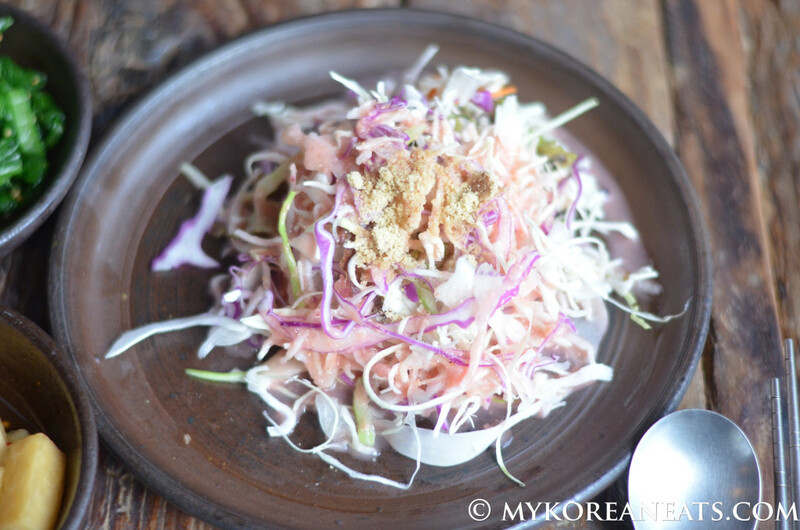 Dotorimuk Muchim (Spicy Acorn Jelly Salad): Although it may not look like it, this dish isn’t spicy at all. 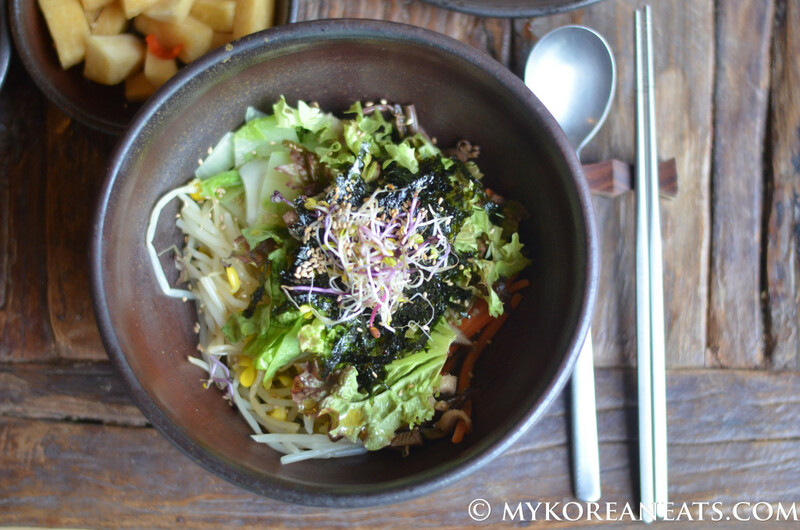 The dotorikmuk and fresh vegetables are seasoned with a sweet, tangy, and addicting gochujang based sauce. For those like Jello without the sugar, you’ll love this dish with its refreshing, crisp taste and texture. 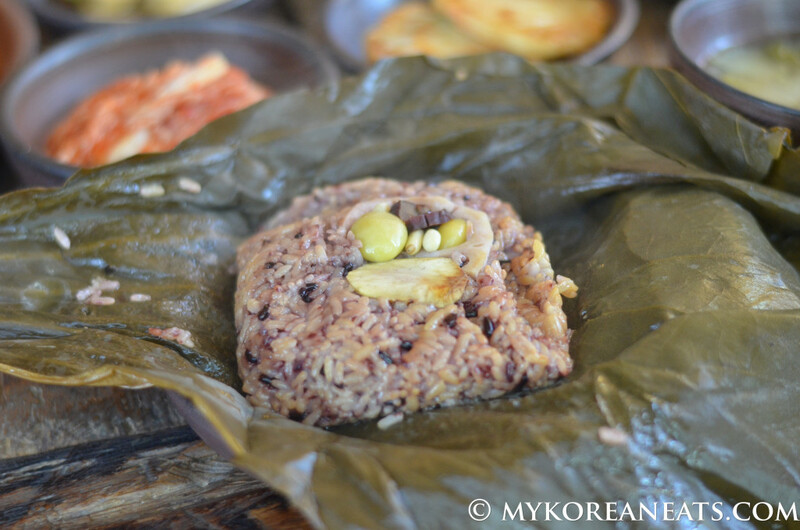 Yeonip Bab (Sticky Rice Cooked in Lotus Leaf). The sticky rice was, well, sticky but that’s about it. I am accustomed to having this dish a tad bit sweeter and nuttier, but I couldn’t find either of those two flavors in this dish (yeah, even with the nuts on top). Also, the lotus leaves didn’t provide any earthiness to the rice, which is something I enjoy from this dish. Cost is 10,000 won ($10). Danpatjuk (Sweet Red Bean Porridge). Sweet, creamy, and mushy (the good kind of mushy). 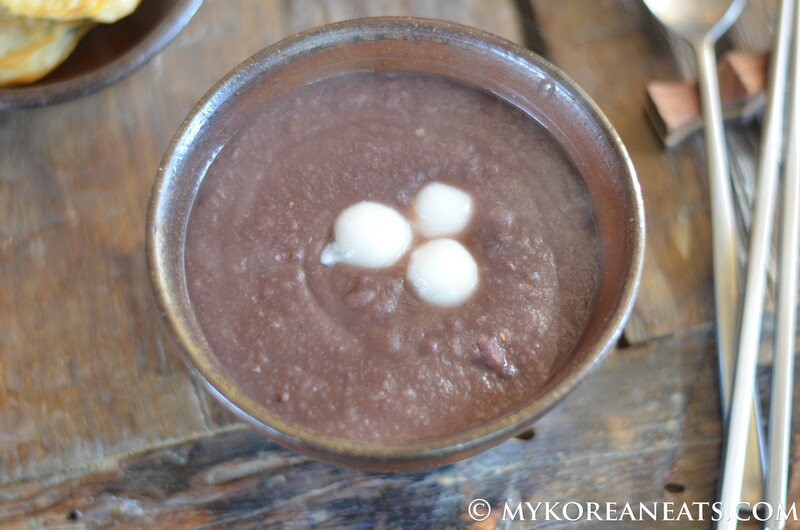 I also liked the sae-ahl or “bird’s egg” (made of rice cake) on top. Too bad they only give you three. Cost is 7,000 won. Although this dish was good, it was just too small a serving size. Luckily, the server let us know in advance so we ordered a third dish. Cool-looking piece of wood, eh? 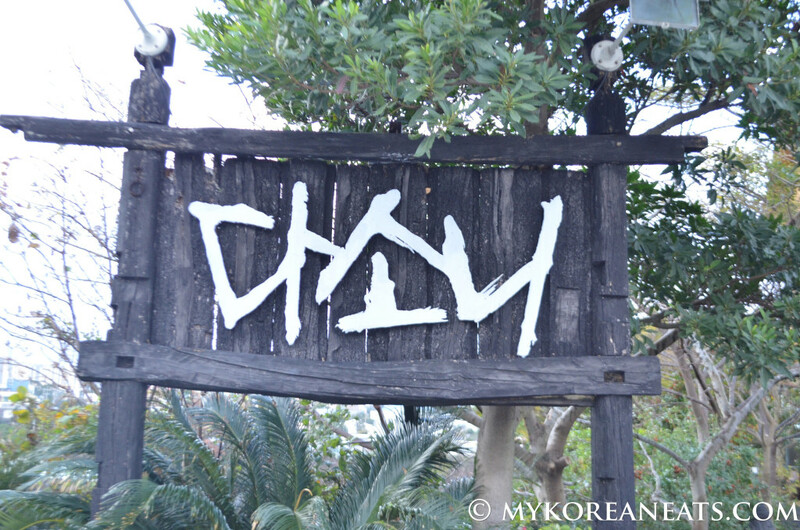 Well, it’s cool because the owner got it from a real chogajip (traditional thatched house) and decorated most of the restaurant with it. There’s always a story to be found for every great restaurant. 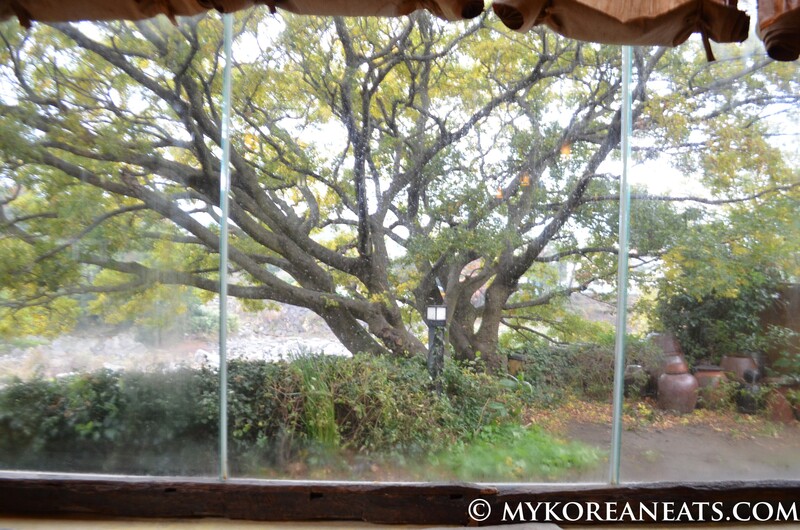 According to the owner, the restaurant would not have existed if not for this large, sprawling tree. In order to save the tree from being cut down, she bought the surrounding land. Thus, Dasoni was born and they have grown together ever since. 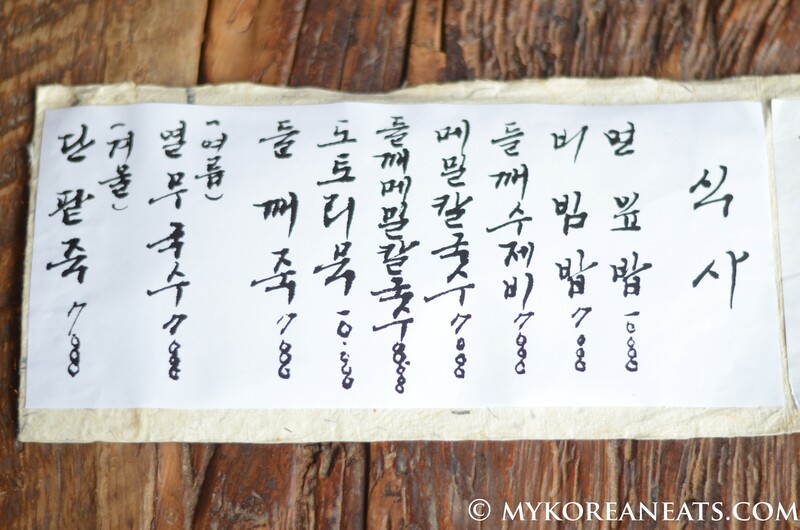 Menu written on hanji, traditional Korean paper. They also specialize in different teas and drinks (non-alcoholic). Omijacha (sweet berry), meshilcha (sweet plum), yujacha (citron), nokcha (green), and daechucha (jujubes) are just a few teas on their menu. You won’t find a lot of these kinds of restaurant in the city. 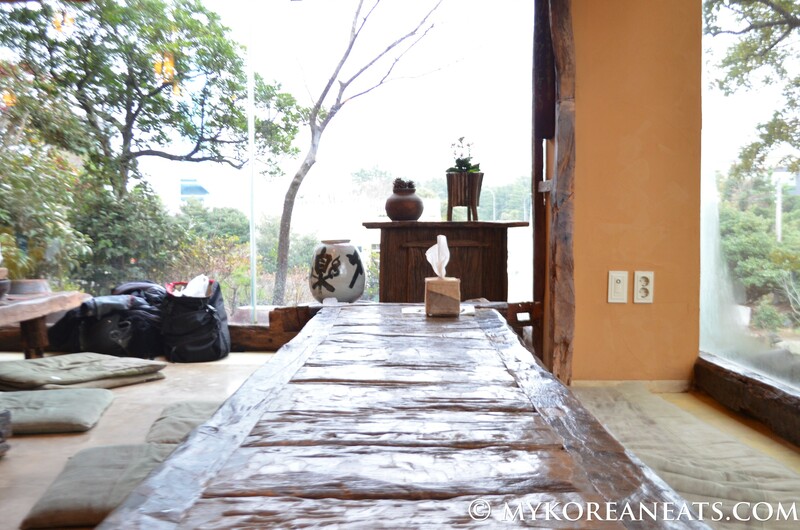 But here it is, nestled in its own semi-secluded area in Ora-dong.